Finding the right name for your new company can be a hard job; there are innumerable possibilities. When we decided to go with Universal Robots, we had two reasons: First, it was inspired by a timeless classic of Science Fiction from 1920 - the Czech stage play “Rossum’s Universal Robots” by Karel Capek. This play originated the first use of the word “robot”. Secondly, and even more important, the selection of our name back then revealed our company’s vision: Developing Robots that are quite literally “Universal”. What are the characteristics of a universal robot? A Universal Robot should be available everywhere. Even if ‘universal’ may not implicate the whole universe, the world is quite enough. So, in order to meet this goal, you have to build a comprehensive and steadily expanding network of distribution partners worldwide. The time when large industrial robots were primarily part of assembly in the automotive industry only, are over and have been so for a long time. Automation technology has been implemented across the spectrum. At the recent International Manufacturing Technology Show in Chicago you could find the UR cobots scattered all over the show. 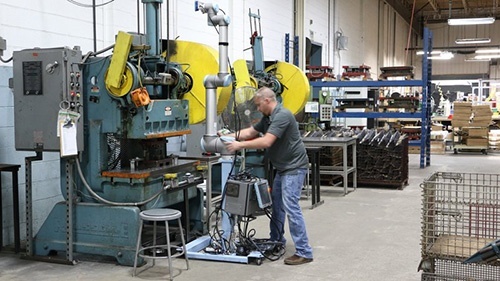 From deburring to induction heating, handling laser marking and simulating collision avoidance. The UR robots were hard at work showing IMTS attendees just how easily a cobot arm can integrate into versatile applications. Watch the many IMTS showcases here. The daily work in all these industries includes a wide range of complex processes of course. There are highly specialized robots for some of them, but a universal one should be able to deal with (at least almost) all of them – flexibility is the key! The Scott Fetzer Electrical Group is proof that this is not just a fantasy, but already realized. 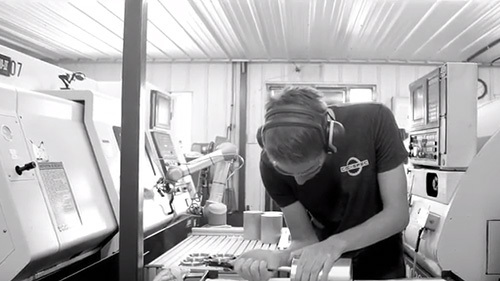 They have 14 collaborative robots mounted on mobile platforms taking over radically different tasks; dispensing, wire cutting, pick & placing and machine tending. Doesn’t that sound flexible? If your goal is to make automation attainable for everything and accessible to everyone, you will make sure that it is also affordable for everyone – from global players to the smallest enterprises. They all have one thing in common: They want to strengthen their competitiveness and market position and are reliant on a quick ROI of their newly implemented technology. As flexible as a robot may be – it will not be universal, unless it is cost-effective. The cost-efficiency of a technology does not only depend on its costs per se, but also on the time necessary to implement it into production. Some companies may have highly qualified IT specialists among their staff and are able to get along with complex new programming tasks very quickly. But if you want to bring automation to all markets, you must not rely on this as a standard practice. How about a robot that can be unpacked, mounted and programmed even by untrained operators in less than an hour? But all this was just about the robot arm, which by itself is a ‘naked tool’: In order to be really universal, it needs to be completed. For this, it needs to be compatible with a vast variety of applications. This aspect is incredibly important, since selecting the wrong product here may send your whole automation process into failure – and make your universal robot useless in relation to your original intentions of automating your production. But don’t panic: This mistake is easily avoidable. 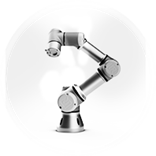 In the new Universal Robots+ Showroom as well as through our partners you may find customized end effectors, software and accessories already optimized for usage with your Universal robot arm. This is what the PLUS means: Real universality doesn’t end with robot arms – even if they already are pretty “Universal”.